The vehicle flown in September's flight at Snow Hill Park in Mechanicsville, Maryland was nothing new for Ryan Henderson, the pilot at the University of Maryland Unmanned Aircraft System (UAS) Test Site, or the audience of naval and defense contractor staff. The crowd of roughly 12 were there instead to determine how well an experimental communications relay would perform under real-world conditions. That afternoon, Henderson, UAS test engineer Josh Gaus, and project engineer Luan Duong successfully navigated a robotic boat almost a mile off shore using radio signals relayed from a Phoenix 60 vehicle soaring overhead. The same telecommunication link was also used to broadcast video from the boat and transmit audio from the team on the ground and a crew on the water. For the naval engineers and project managers from Alion Science & Technology in attendance, the test was early evidence that a wireless mesh network powered by Silvus radios—a rich interconnection among devices capable of remaining stable even when individual nodes fail—could expand the communication reach of vessels and shore facilities used in naval operations. Preparation for the September 20 test flight began in May, when NSWC PCD shipped their EMILY unmanned surface vessel to the test site's hangar in Southern Maryland. 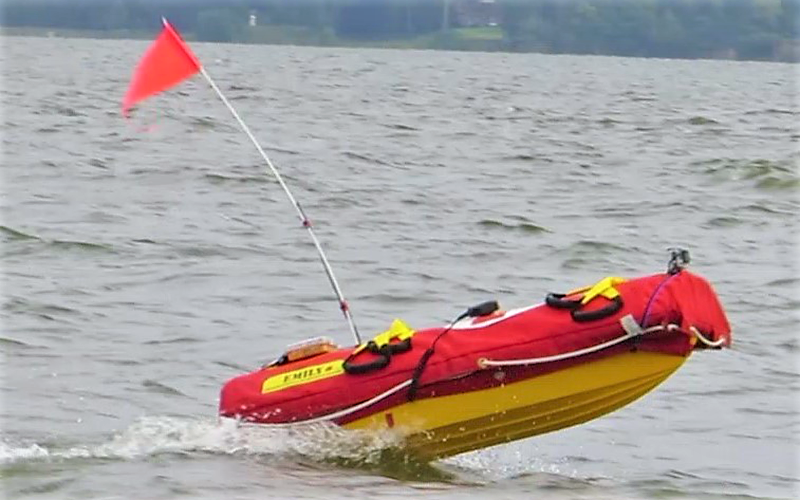 Built by the company Hydronalix for swift-water rescues, EMILY was a limited-use remote-controlled boat—until Gaus retrofitted it. The Snow Hill Park test is the latest in an array of operations designed to characterize the capabilities of UAS relay communications. The UAS Test Site has also partnered with the Naval Air Warfare Center Aircraft Division and Naval Warfare Center Indian Head Explosive Ordnance Disposal Technology Division to extend the distance between a bomb disposal robot and its operator by tens of miles.